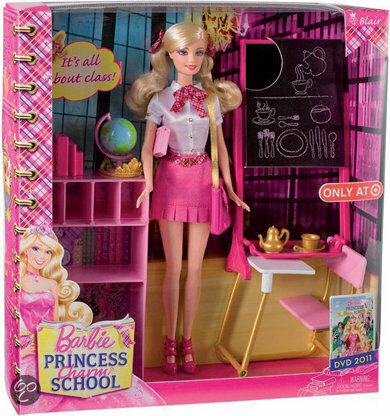 Barbie Princess Charm School - Classroom playset. This playset is exclusive at Target.. Wallpaper and background images in the Sinema za Barbie club tagged: barbie princess charm school. This Sinema za Barbie photo might contain tights and leotards. ^Do you know more words, meanie? Also, it'd be better for them to make Isla as exclusive doll! Rawr. Also, me do thinks, that her skirt is too short. It's awesome! But yes, skirt is very short! Her skirt is too short than the others. Yes,the sikirt is to short. I thought it's not ok for a princess to wear short skirts .Oh ,I forgot that this is modern princess movie . BTW the school class is nice .And I don't like the doll very much . Yeah, the doll could be a lot better.